We can’t thank you enough for the great day on Mille Lacs yesterday! 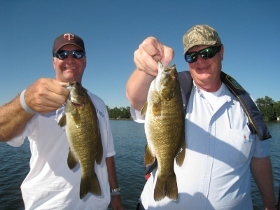 We appreciated the tips and teaching you gave that will help us when we venture on to Mille Lacs to fish for smallmouth. We both learned a great deal and were surprised by what we learned! I have fished with a lot of guides over the years. Some good, some not so good. I can honestly say that you are without a doubt, the best with whom I’ve ever fished. Learning and having fun with the guide and fishing partners is the most important thing to me on a guide trip and we achieved both of those objectives yesterday. The quantity and quality of fish were an added bonus! Thanks again and hopefully, we will be able to connect again next year for another great day on Mille Lacs!